Gasera’s PA201 custom gas cell is designed for laboratory measurements and it can be easily tailored for different types of light sources such as the near infrared distributed feedback laser (DFB), the quantum cascade laser (QCL) and the optical parametric oscillator (OPO). Laser photoacoustic spectroscopy (LPAS) is highly attractive method for trace gas analysis due to the high sensitivity, linearity, and low sample gas volume. 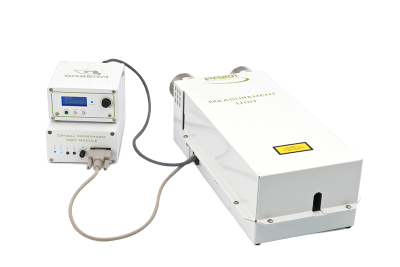 Tunable laser sources provide high selectivity and high measurement accuracy due to the zero background nature of the measurement principle. Measurement pressure: between 300 mbar – 1000 mbar. Real-time DSP (digital signal processing) unit for providing an analog and digital output signal proportional to the cantilever movement. Analog signal is connected with BNC output connectors and digital signal uses USB. Three gas connections. The sample gas has two connections, one for input and one for output. The input is equipped with a particle filter. The gas exchange procedure is user configurable by a simple user interface with display and buttons. The gas exchange can be started manually with a press of a button or the controller can be programmed to do it automatically using timer or an external trigger. Detection limit: Gas and light source dependent. Typically in the ppb -region with NIR diode lasers and ppt-region with MIR quantum cascade lasers.